No one in the rough-and-tumble world of local governmental PR plays a harder game—and has been more successful at it—than Carol Reed. Dallas has always spent an inordinate amount of time primping before its mirror, making sure the hair is perfect and the wrinkles don’t show. That’s why publicists and media consultants thrive here. Most spin fluff. For years, Dallas publicists concerned themselves with how often they could get their clients’ names in the around-the-town newspaper columns of Helen Bryant and Alan Peppard. Carol Reed is among a rare breed of publicists who play an edgier game. Lisa LeMaster built an agency around crisis management. Rob Allyn’s company, before and after he sold, took on heavy political battles and tough civic challenges. But in the hardball world of Dallas politics and bond elections, there hasn’t been a cleanup hitter quite like Carol Reed. Not over the past quarter century, if ever. Of the many words that might be used to describe her, fluffy and giddy do not spring to mind. In and out of meeting rooms, she is sharp-witted and, when she so chooses, sharp-tongued. She’s also brash, cocky, funny, and blunt. Reed became a political player in Dallas more than 30 years ago and forged her own way, from carrying the hors d’oeuvre tray to calling the shots. She’s managed or helped manage the campaigns of five of the last seven Dallas mayors: Jack Evans (1981-’83), Starke Taylor (1983-’87), Annette Strauss (1987-’91), Ron Kirk (1995-2002) and now, Tom Leppert. She carried the American Airlines Center election, the Trinity River Corridor Project, Arlington’s Cowboys Stadium, and the Dallas Convention Center hotel referendum, all tough issues that began with her side the emphatic underdog. Reed avoided the fluffier, more traditional approach to public relations by parachuting into the Dallas scene from above. She started as a political director for U.S. Sen. John Tower (R-Texas) in the late 1970s, helped organize the Reagan/Bush presidential campaign in 1980, and was the North Texas political director for U.S. Sen. Phil Gramm (R-Texas). She lived for most of that time in Dallas, built impressive contacts here, and in 1981 decided to put her primary focus on the city. One particular election—Ron Kirk’s first mayoral campaign—was the catalyst for her prominent rise as a difference maker. From his Washington, D.C., office where he serves in the Obama administration as United States Trade Representative, Kirk looks back and laughs and says, “I have had to remind Carol, ‘It ain’t the jockey; it’s the horse.’ I’d like to believe I brought something to the table. She did it by beating the good ol’ boys of Dallas on their home turf. And then she paid them back by becoming one of them. 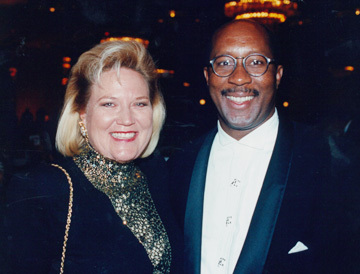 RIGHT-HAND WOMAN: Carol Reed with former Dallas Mayor Ron Kirk in 1998. photography courtesy of the Reeds Public Relations Corp. The year was 1994, and Dallas had never had a black mayor. As Gov. Ann Richards’ Secretary of State, Kirk mustered a mere 12 percent name recognition in Dallas. But most of the candidates for mayor weren’t much higher. Reed asked one of North Dallas’ most prominent citizens to call together, as she puts it, “the guys with their names on the freeways,” to meet with Kirk. Dallas’ image of the black leader had been shaped by the loud and proud rantings of John Wiley Price, Al Lipscomb, Diane Ragsdale. Rather than run from the race issue, Reed confronted it—in her own way. She told Kirk to keep his mouth shut throughout the meeting. For weeks, they spent time and money attending coffees all over North Dallas. Every precinct staged a party in somebody’s home. They worked South Dallas and Oak Cliff, but the real battles were waged—and won—in North Dallas. Kirk won with 62 percent of the vote and no runoff. And when he became mayor, he leaned on Reed for advice. He won a second term with a landslide 74 percent of the vote in 1998. Within that same nine-month span, Dallas had to decide whether it wanted to build a new arena, the American Airlines Center, and whether it wanted to dump money into refurbishing the Trinity River corridor. Reed ran both elections. Reed completely shifted the strategy. They did, by 2,600 votes. Another vote on a massive urban-development project along the Trinity River provoked more outcries, more divides, and yet another come-from-behind victory. Kirk was always proud of his ability to build coalitions. Those skills, and Reed’s strategizing, sealed the $250 million project. Her game plan, back then and to this day, is to focus on three primary areas of attack. And never stray. Dallas businessman Ward Lay, CEO of Andeluna Cellars winery, describes Reed as an organized person who “cuts through stuff” with personality, charm, and wit. When he was working with Reed on Jerry Rucker’s 1990 campaign against Rep. John Wiley Bryant (D-Texas) in the 5th Congressional District, Lay recalls, they were having trouble persuading a party official in Washington, D.C., to release some promised funds for the GOP hopeful. Reed advised Lay to personally phone the official, whom he’d known for years, and state the candidate’s case. “I did,” Lay says—and the money was soon on its way.